Hanging Out | Sprezzatura, Y'all! Monday we were invited to a lunch for Busatti customers. They have an annual meeting of all their stores in Italy and conclude it with a lunch. It was an interesting buffet – very American fancy cocktail party kind of food. Little bites of things in beautiful individual crocks or plates and you really had no idea what you were eating. It was all good and the prosecco was flowing and it was a nice way to spend a couple of hours. 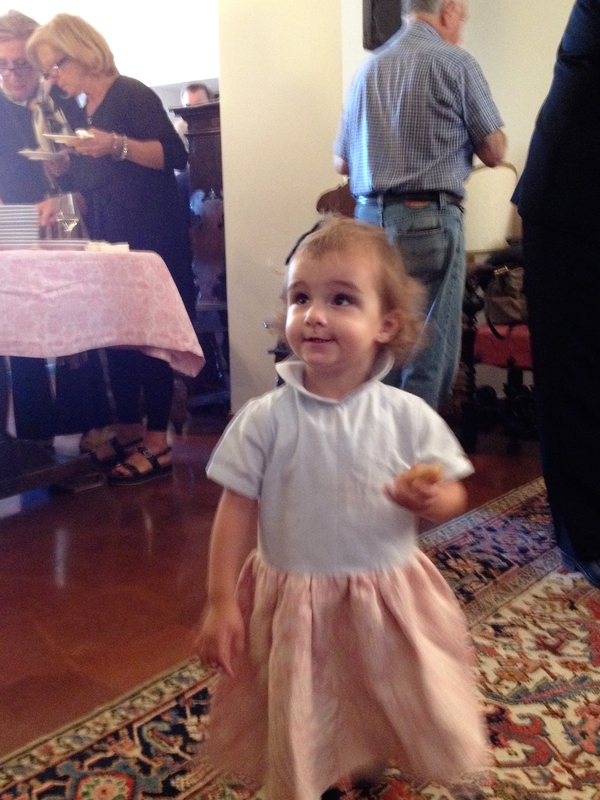 The star of the show was one-and-a-half year old Francesca, daughter of Anna and Livio and granddaughter of Giovanni and Paola. She’s adorable and we were here when she was born, so were very happy to see how much she had grown. She’s just starting to talk and says words in both Italian and German. Later we drove to Sansepolcro for a little shopping and to have dinner. We went to our favorite little L’Erbolario shop (Myra, the same woman is still there) and loaded up on our favorites. 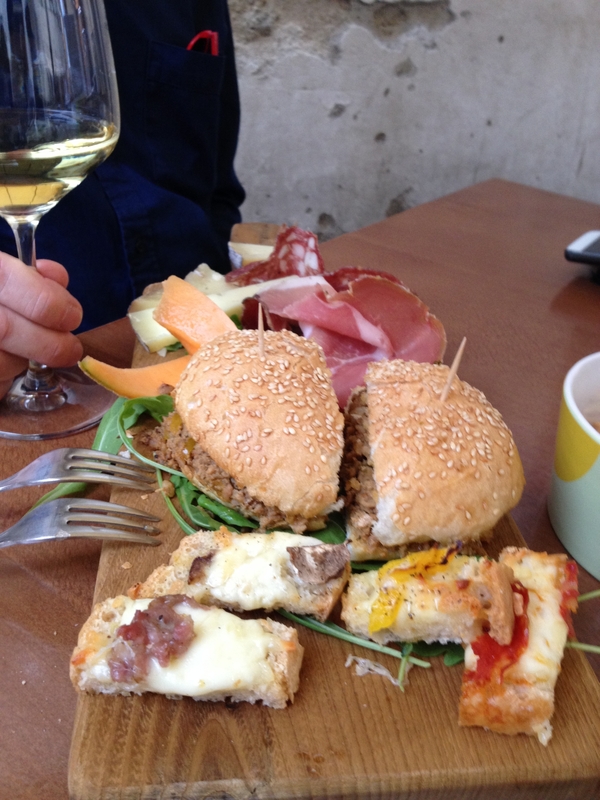 After shopping, we stopped to have a drink before dinner and had “Ore de Felice” – Happy hour. That means you get a drink and a nice little spread of food for a set price. You could make a meal off this. For dinner, we again felt the need to take some time off from pasta so we both had meat. And fried zucchini blossoms and more fried porcinis. We had dinner at Ristorante Fiorentina in the beautiful old dining room. We ate early – at 7:00 – and were the first people in the restaurant. By the time we left, it was packed. I had the Tagliata (sliced beef) and Steve had a fillet. And a fabulous bottle of Vino Nobile di Montepulciano. The entire meal, including side dishes and salads was about $95. I love this – this meal in the US would have easily been $200. And we liked the wine so much we bought a bottle to take home – for less than we paid to have it with dinner. I remember this from before. You can always buy wine at a restaurant to take home and it’s almost always a few dollars less than what it cost to have it there. Wonderful day. 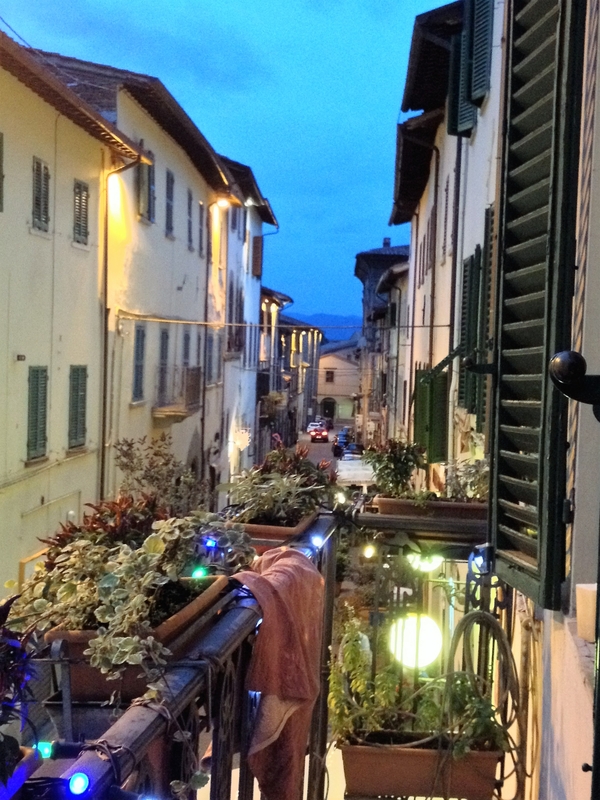 I love this part of Italy – the food, the wine, the people, the lovely villages. It makes me feel happy and makes all the troubles of the world seem far, far away. And I like that.